What Do Mormons Do on Christmas? | Mormonism: Really Want to Know? « Is Race a “Taboo Topic” in LDS Church Services? My mother used to joke that Easter and Christmas were the only two days of the year when all the rest of the Christian world goes to Church, and the Mormons stay home. She wasn’t too far off the mark. Easter occasionally falls on the same Sunday as our worldwide General Conference, which means we would be watching Conference at home rather than going to Church. And, unlike many other Christian sects, we do not have services on Christmas Eve or Christmas Day. It isn’t like we don’t celebrate Christmas. We do. (It’s the Jehovah’s Witnesses that skip out on the holiday). The Christmas season is a cherished time for Latter-day Saints. 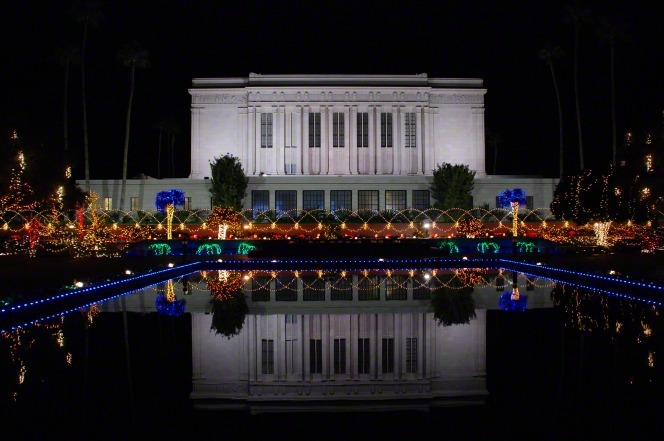 We have a Christmas Devotional near the beginning of the month, broadcast from Salt Lake City with talks from the president of the Church and other general authorities, accompanied by uplifting music of the season. This year, the Church has released a Christmas video called “He is the Gift,” which has attracted positive reviews from people both in and out of the Church. Check it out here. Local congregations have a Christmas program at some point during the month, and it isn’t unusual to have Christmas trees in our lobbies, youth going out caroling, and Christmas parties among the members. We see it as a time to reflect on God’s gift to the world in the form of His Only Begotten Son. We try to set aside time to cherish the birth of the Savior, to meditate upon His ministry, and to give thanks for His atoning sacrifice. We try to dedicate ourselves to service in order to better emulate Him and follow His commandments. We rejoice with the rest of the Christian world in the blessed events of Bethlehem. What we don’t do, however, is hold any sort of Christmas “mass” or other service on Christmas itself. If Christmas falls on a Sunday, we will usually abbreviate our usual block of meetings to a single Christmas-themed service. Our focus, however, is (as always) on the family, and we believe that Christmas is a time when families should be brought close together. At the same time, we don’t get caught up in criticizing Christmas’s pagan roots. While we recognize that the date of Christmas was chosen for reasons unrelated to Christ’s actual birth, and we understand that Christmas trees and mistletoe were not a part of the earliest Christian tradition, we embrace these traditions as ways of honoring the Savior. Images of Santa and Rudolph, although having virtually no religious connotations, do not send us screaming out into the snow. Generally speaking, we celebrate Christmas like everyone else, except that our egg nog has less of a kick. The reason we embrace the Christmas season, even with its converted non-Christian traditions, can be found in the Book of Mormon. As one ancient American prophet explained: “For every thing which inviteth to do good, and to persuade to believe in Christ, is sent forth by the power and gift of Christ; wherefore ye may know with a perfect knowledge it is of God.” (Moroni 7:16). Because the Christmas season brings Christ to the forefront of our hearts and minds, we can rest assured that it is of God. It becomes a time when “we talk of Christ, we rejoice in Christ, [and] we preach of Christ,” (2 Nephi 25:26), and we invite all to come closer to Him. Reblogged this on Brother Jon's Page. I have not reblogged for a while. Here is a good one on Christmas and Mormons. OUTSTANDING! I need to post this to every other everything in the world. Wow. No hyperbole there! But thanks. Hyperbole? Isn’t that a bully who is hyperactive? New here. Seeking information. I appreciate the blogs, and whether I am ready to believe or not, very informative. Thanks.